The second collection of stories from Smokey's autobiography. 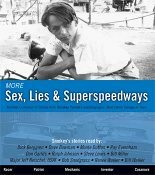 Readers from all across racing bring you over 8.5 hours of stories, on 7 CDs, from Smokey's book. They also share their stories about Smokey along the way. Great for those long trips to the races, stuck in traffic around town or even working out in the garage.